The Hunter Douglas Pirouette window treatment shades combine the fabric roman shade with the ability to control light in an entirely new way. Pull the operating cord and the shade folds transform to opened vanes, allowing a softened outside view through the sheer backing. These window covering shades are a higher price point window covering product, yet it is one of our more popular selling window shades. 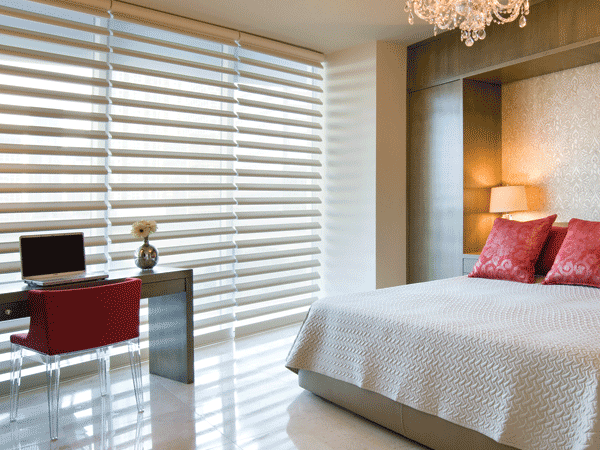 This exclusive Hunter Douglas window shading has the elegance of a classic fabric shade and sheers. 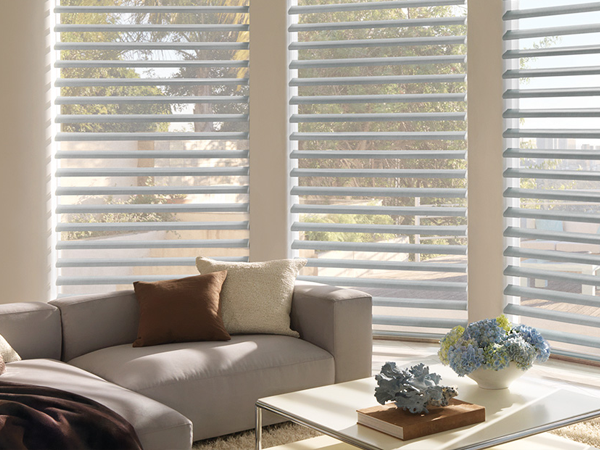 This unique Pirouette window shading is only available with Hunter Douglas. Call or visit Sheila’s Window Toppers at our Calgary NW showroom to see them on display. At the heart of Pirouette window shades is the revolutionary Invisi-LiftTM system. Allowing the horizontal fabric vanes to float gracefully. Learn more about Pirouette Shades. Pirouette Shades For Your Window! 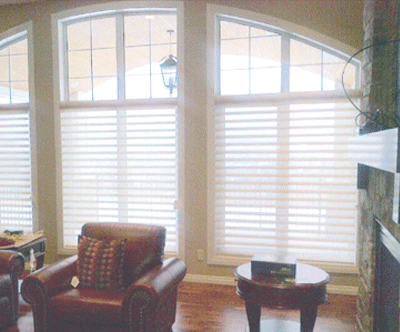 Pirouette window shadings are available in 2 vane sizes, 4″ Petite and 5″ Grande. Choose from seven beautifully textured fabric styles – Satin, Satin Metallic, Linen, Cotton, Bamboo Flax, Shantung and Angelica – in a palette of 65 color options. Pirouette fabrics, colors and vane sizes are available in room-darkening or semi opaque variations. There is no other window covering that is so complete. Variable light control, privacy, and view through, all in one shading. PowerView Pirouettes open and close with a push of a button, smoothly opening and closing the vanes. . . . .beautiful and displayed in our Hunter Douglas Crowfoot Showroom!